Compute the group delay of a digital filter. Numerator and denominator coefficients of a filter transfer function. If None (default), then compute at 512 frequencies equally spaced around the unit circle. If a single integer, then compute at that many frequencies. If array, compute the delay at the frequencies given (in radians/sample). 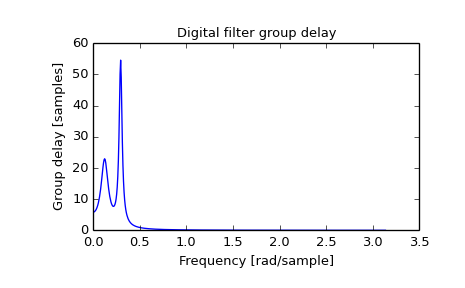 The normalized frequencies at which the group delay was computed, in radians/sample. The similar function in MATLAB is called grpdelay. If the transfer function \(H(z)\) has zeros or poles on the unit circle, the group delay at corresponding frequencies is undefined. When such a case arises the warning is raised and the group delay is set to 0 at those frequencies. For the details of numerical computation of the group delay refer to [R177]. [R177] (1, 2) Richard G. Lyons, “Understanding Digital Signal Processing, 3rd edition”, p. 830.